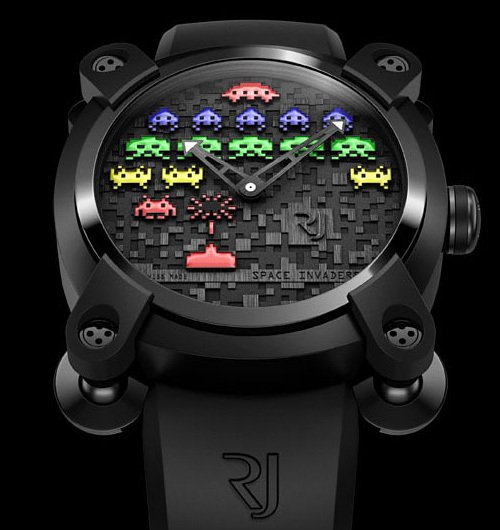 Romain Jerome Does Space Invaders | OhGizmo! We’ve got a soft spot for the truly original designs of Romain Jerome’s luxury watches. In the past they’ve incorporated everything from moondust, spacesuit fibers, pieces of Apollo XI, dinosaur bones, coal and steel from the Titanic and even volcano ash into their designs. It kind of makes their latest timepiece seem downright boring, though ironically, far more enticing to any of us who appreciate old-school gaming. Teaming up with the TAITO Corporation, Romain Jerome’s latest creation pays tribute to Space Invaders, with two unique designs that are limited to just 78 pieces each. As a tribute to the game being released waaaaay back in 1978. But as usual the watch’s appeal isn’t just limited to its pixelated tribute graphics. Inheriting the highly distinctive case of the Moon Invader series (a round shape within a cambered 46 mm square, with a round front and an almost rectangular back), the SPACE INVADERS have also kept the same steel coalesced with fragments from the Apollo 11 capsule. It is no coincidence that this case is designed like a strongbox, or even like a space vessel capable of travelling great distances, since that kind of vehicle is exactly what is needed to facilitate the SPACE INVADERS colonisation of our daily lives. The four functional ball-and-socket joints of this rounded squares are cut like the pivoting « feet » of the lunar landing modules of the American lunar missions. These extremely sophisticated components mounted on axles anchored in the case hold the lugs of the rubber straps and enable the watch to adjust to all kinds of wrist sizes. Embodying another tangible token of the space age symbolised by this new SPACE INVADERS collection, a dedicated plate made of Moon SilverRJ– a silver alloy with an extremely low oxidisation rate incorporating moon rocks – appears on the stellar-patterned back of the watch. This engraved plate reproduces the lunar surface, of which the mineral particles interact on an infra-molecular level with the wearer of the watch. Available in two versions, the full color model pictured above and a black and white version with the characters covered in Superluminova causing them to glow at night, the watches are expected to sell for between $10,000 to $15,000. Which is sadly pretty affordable when compared to previous Romain Jerome models. Quick someone make a clone and I’ll buy it in a heartbeat! How much does the watch cost?